Dr Charlotte Bishop joined Exeter Law School as an Associate Lecturer in 2014 and is now a Lecturer (Education and Research) in Law. She graduated from the University of Kent in 2004 with a First Class Honours degree in Law (LLB) and the Kent Law School Departmental Prize for Special Achievement in Law and completed her doctoral thesis at Exeter University in 2014. Charlotte’s research interests are broad and inter-disciplinary, crossing the boundaries of socio-legal research into psychology, sociology, philosophy and criminology. 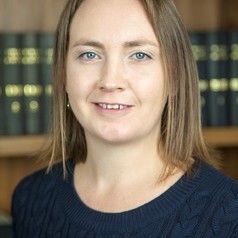 Her recent research has been on how the harm of domestic violence, including controlling and coercive behaviour, could be more effectively evidenced in criminal court proceedings, and how courtroom participation could be made safer and more effective for witnesses who are also a victim of domestic violence. Charlotte's research takes a gendered approach to the issue of domestic violence and much of her work is also based upon the insufficiently recognised link between ongoing abuse and trauma. Charlotte convenes the core undergraduate module Criminal Law for 1st and 3rd years and also convenes an optional 3rd year module Gender, Sexuality and Law.